Running. Fitness. Healthy eating. Training. Workouts. All of the above. A Goal, and a Plan. After this year was not as successful as I wanted it to be with running due to my injury, I’ve decided to set a pretty high goal for next year. I want to run a spring half in under 2 hours. My first half marathon last November was awesome. I loved every second of it. Had a great time, and felt fantastic the whole way. Never felt like I was really going “all out”, but I was also running with a friend. Fast forward to this year, where I was hoping to run at least 2, possibly 4 halfs and gradually decrease my time (on my own. . with some training plans I had found thru Google). After being injured, the only race I’ve done was a 5k with family a few weeks ago. I have signed up with a running coach, who also happens to be a friend. He is an awesome triathlete, smart, and also happens to have a kinesiology degree. I’m a little bit nervous about running five to six days a week, that’s a lot of time with 2 kids and a full time job and all the other things that “life” requires. But having a coach gives me accountability, and someone to guide me where before I was just running to run. So that’s what I will be doing for the next 9 months. And instead of an adorable tiny human at the end, I will get to say I ran a half marathon in under 2 hours!!! I’m going to try to blog and talk about what I’m doing and how it’s going so if nothing else, I can have a log for me of how my training went and what I learned. I had a great week for my birthday. 31 years young!! Monday, I did 3 miles of treadmill sprints. One min of dead sprint, 45 seconds rest, repeat for 2 miles. Then a cool down mile. It was a great workout. Tuesday, I did BootCamp class at the Y. It was a nice change from my normal, and is a great mix of strength and cardio. Wed I went for a lunch field trip with a friend, to break in my new birthday present. Thursday, we got a new kitchen table and chairs delivered, and I took a 3 mile run outside. 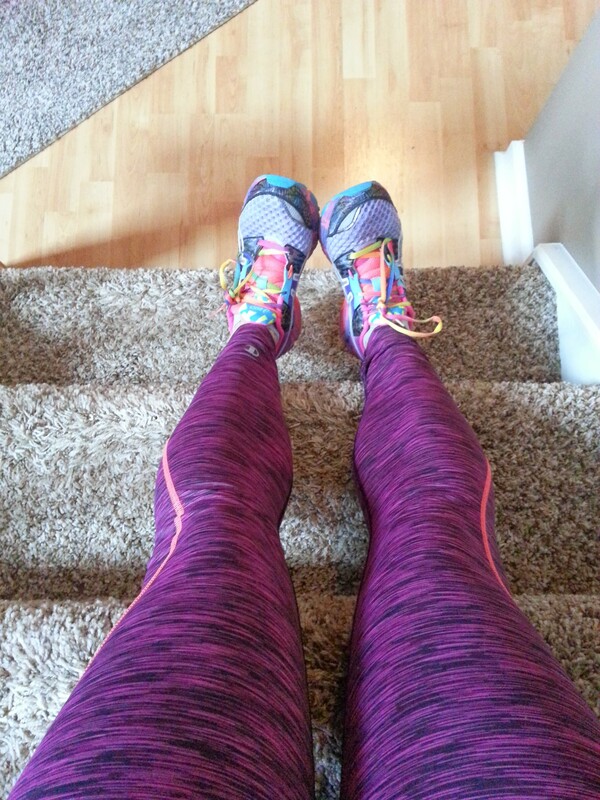 I absolutely love these running tights from Target. I should have bought 3 pairs. I have not been able to find any that fit as well as these. Today, I did Strictly Strength class. Tomorrow I’m volunteering with the Susan G. Komen Tissue Bank collection event. They are the only and largest bank of healthy breast tissue with matched serum and DNA in the world. They use this bank to provide access to tissues to researchers who want to find out more about breast tissue. Click the link to find out more! I’m hoping to get my training plan down on paper for the Indianapolis 500 Festival Mini Marathon. I will be running this on May 3rd, my second half marathon. I’m hoping to break 2:15, but if I can finish under 2:30 again, I will be pleased with that. What spring races are you all gearing up for? Much better week this week! This week has been much better. Very busy, but much better in the workout and sewing department. My husband started with a trainer last week. He is going two days a week!! I’m so proud of him! He sort of hates me when he can’t lift his arms, but I keep telling him to stick with it; it will get better! I have decided to give up Diet Coke. We will see how this goes. Replacing with hot and cold tea. . which has to be better for me, right? For my “bubble fix” I found that Nuun works really really well! I might try some more “natural” sodas, but for now, I’m going cold turkey. Mind you, I am NOT giving up caffeine. . my AM coffee is a must-have for me! I was able to get in two runs and two days of strength training, and I might very well do a double workout today so I can get a run in while it’s warm. I guess “warm” is a relative term; it’s already 34 degrees this AM, and might get up to 45 tomorrow! As long as it’s not raining, you can bet I will be out there. I ran on the treadmill Monday and Tuesday. Tuesday was windchills in the -30’s, so inside it was. Wednesday, I did BodyPump at lunch and abs class. The new release of BodyPump was tough! Good, but tough. I always struggle with how much weight, and end up adding or subtracting weight in the middle of the set. I think the instructor said we did 170+ reps for the triceps track, WOW!! I think that my strength training is really paying off with my running. My 2 miles I did on the treadmill on Tuesday seemed “easy” to me. I walked out after doing that and planks/abs and felt really good, and was surprised. I’m exited to hopefully get to be a faster runner and stronger all around this year. Thursday was a rest day. We went out to supper with a friend, and had a good time! Today will be Strictly Strength at lunch, and then maybe a run tonight if the kids cooperate, if not maybe first thing in the AM tomorrow. My running goal for the month of January was 30 miles. With the pretty serious snow and cold weather we have had, and my strong dislike for the treadmill, I was able to knock out almost 23 miles. Last year, I didn’t run over 20 miles in a month until August, so this is a great start! 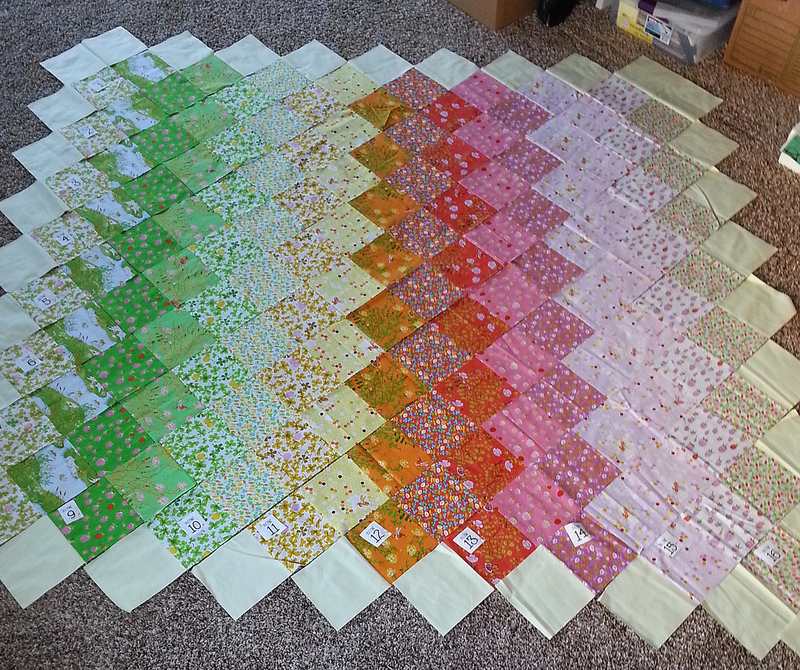 I wasn’t able to get in as much sewing as I would have liked this week, but I did get the quilt as you go panel for my Sew Sew Modern 4 swap partner done, and all the pieces cut out and ready to interface and put together. And everything hurts. Full body strength class Friday, Saturday I ran 3 miles outside (which felt like 6 with the 27 mph winds! ), and then shoveled the driveway. I will be glad when shoveling does not count as one of my workouts. Yesterday evening the kids and I went to a birthday part at a bouncy place, and it was crazy. Today I will be getting all my things for my Sew Sew Modern 4 swap partner, as well as for a special friend’s bag who starts chemo next week, and going to the grocery store. Meal planning is done! 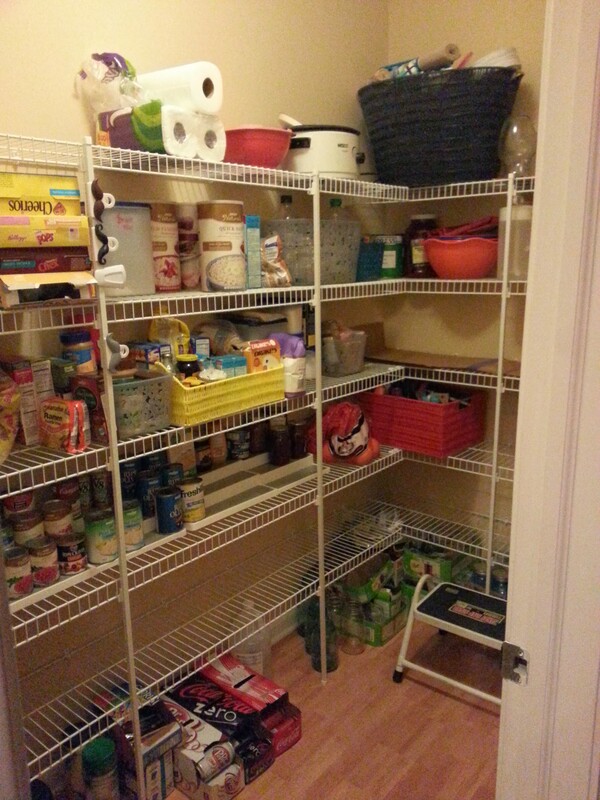 I always have a better week when I’ve meal planned and grocery shopped in advance. Makes the evenings go much smoother! Stay tuned for progress pics! Stay warm, and have a great week. What workouts do you have planned for the week? I should have titled this “Fail Week”. It’s really cold. Windchills in the -20 F cold. Kids have had delays, no school, and have been at each other’s throats ALL week. I have had a stiff shoulder/neck/back that will NOT go away since last weekend. We have had our bed laying on the floor due to a broken rail for over 3 months now, and I think it’s time to get a new frame and mattress. I have started using Pan-Away from Young Living, as well as Tiger Balm. Nothing is helping. Thinking about giving in next week and going to the Dr to get a muscle relaxer and see if it helps. Yuck. I did run Monday when it was nice outside, and had plans to work out Wed. The shoulder/back is worrisome as I find myself favoring it during daily activities, so I don’t want to do BodyPump or any heavy lifting on it; I’m afraid I will have horrible form and really hurt myself. On from the pity party. 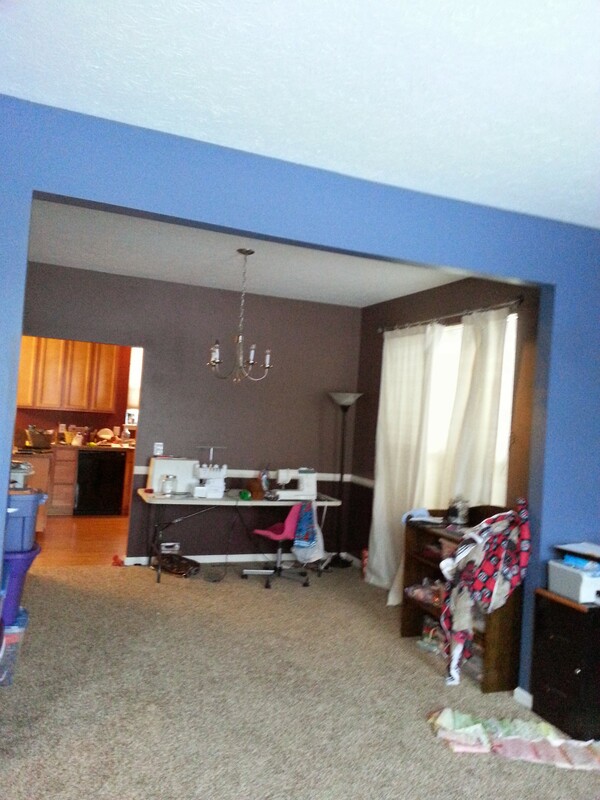 I got my sewing room cleaned out, as well as the pantry. SO much better. Not showing the “before”. After cleaning. I will be back soon to get some ideas on how to finish this! I would really like to get to IKEA and get some cabinets to start organizing fabric in so I can get stuff out of my tubs out somewhere where I can appreciate it! 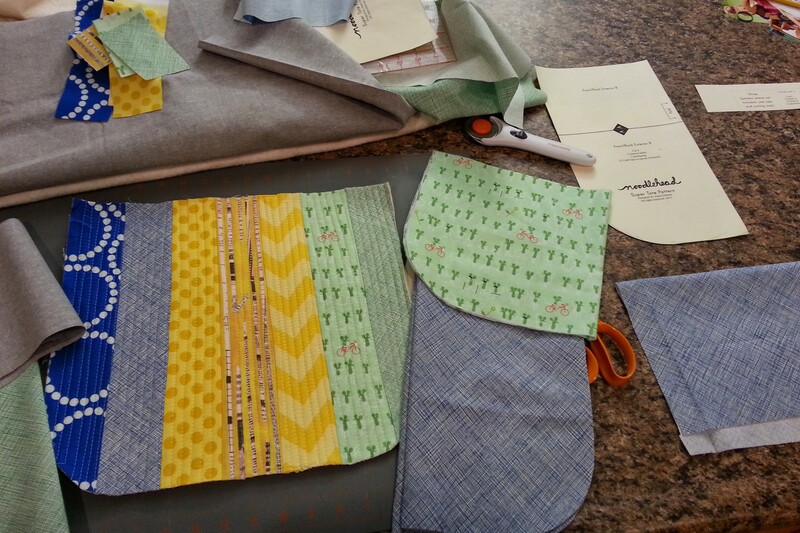 I also got a little more done on my EPP from Sewing Summit. I will finish it yet!! I need to find some better thread, as the Coats and Clark I have keeps tangling. I found some “Thread Heaven” in a box, and will try that next week and hope it helps. I am looking for a fast and easy quilt pattern that isn’t too complex, and could use a collection of FQs. I have a couple of lines of fabric I want, but I need a pattern first! All suggestions appreciated!! I DID get hooked up with a team for Ragnar Chicago and I am SO excited!! Seems like a great group of people and that it will be a good time. It’s a mixed gender team, and most have run before. The first legs I was offered were over 13 miles with “hard” and “very hard” segments. I gracefully bowed out and the team was very understanding and we have a leg I’m totally comfortable with. It might be #1, but I feel better about it!! Thursday, I did Zumba at lunch with my favorite instructor, Stephanie. She had a new routine to the Pitt Bull and Ke$sha song “Timber” which is one of my current favorites! So fun. We also did “Apple Bottom Jeans”. . her routine leads to 100 jumping jacks in the song (yay!) and then “Push It” which is 4 min of squats (body weight) and then 4 min of arms/shoulders. It was a GREAT class! Friday was Strictly Strength class at work. Saturday, I went to the Y, and ran 3 mi on the treadmill. My IT band is still giving me fits, so I took it slow. It actually felt much better than after my 4 miles last week, so I’ll take it. My first race this year isn’t until May (the Indianapolis Mini Marathon) so I am feeling okay about having some low mile weeks. We are also STILL having snow, so it’s hard to get outside. Better safe than a broken anything! Today, I will be shoveling the 3-4 inches of snow off the driveway, chasing children and taking the dogs to get their nails trimmed. I think that counts as #sweatnsew! Oh, and hopefully piecing a little more of my Briar Rose quilt this afternoon! 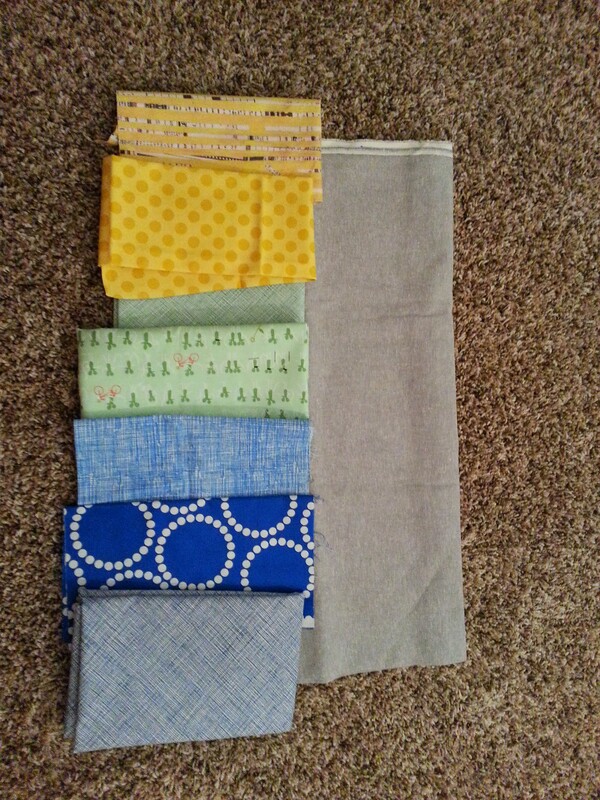 Here it is all laid out in my sewing room on the floor. Hoping for a design wall sometime soon! What Daaay is it!?! 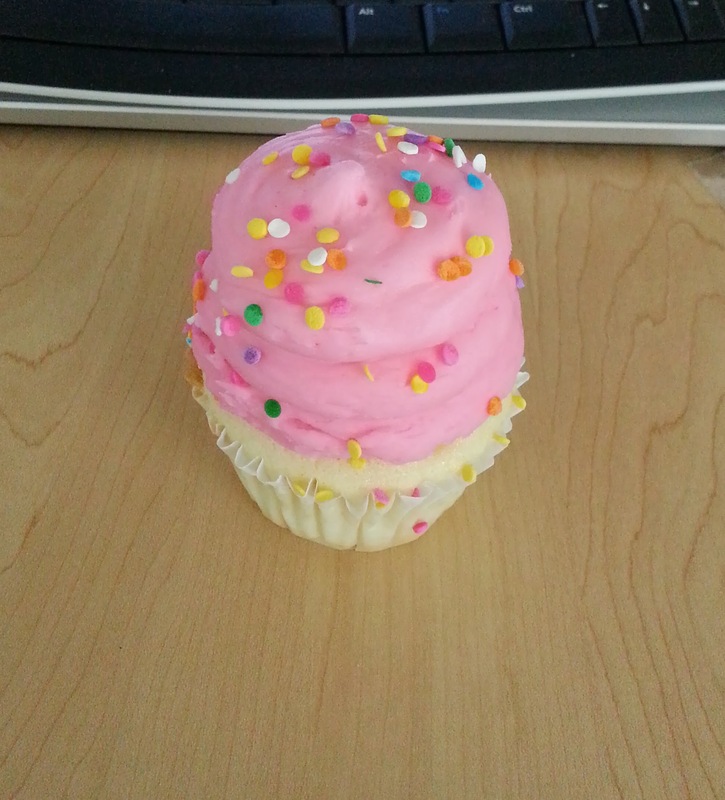 You know what day it is! It’s Wednesday! Mid week check in. What fitness minuets have you done this week? For me, the week started off a bit slow, but I am feeling much better now. I ran 3 miles on Monday because it was 49 degrees in Indiana in January. Slow pace, average 10:30 but after the IT band flaring up from the treadmill run, and being sick all night Friday and a very long weekend, I was OK with that. It was a GREAT day to be outside and running! Had to dodge some snow and ice, but well worth it to be outside and not on the treadmill. Tuesday was a rest day. Perfectly fine with that. Today, I did a strength and endurance Boot Camp type class at the YMCA. Other than the fact that it was SO packed you could hardly move, it was a good workout. To be honest, I almost walked out when I saw how many people were packed into the room! I have started tracking my food on FitBit again, maybe this will help me break that 140 lb rut I have been stuck in for so long. Plan for the rest of the week: Thurs either Zumba at lunch or rest, Friday whole body strength at lunch, Sat off day (or run depending on how I feel) Sunday run 5 miles-long run. I also think I found a team for Ragnar Chicago!! I super hope so anyway, no one has contacted me back to let me know for sure. I really want to participate in one of these races this year, and would like to do one within driving distance of home. Also, note that sign ups have opened for the Runner’s World races!! They have a Kid’s Fun Run, a 5K, a 10K, and a half marathon. They also do bonus goodies if you do more than one race! This would be a family trip for me more than likely, but I have not ruled it out yet. Hopefully I can get a little more details on travel I will be doing for work this year soon, and will be able to make a decision about if we can do this or not. What race are you looking forward to this year? This weekend didn’t go as I had planned. I was really hoping to get in a solid 5 miles, and maybe another easy run. Totally didn’t happen. Friday I did get a good strength class in at lunch. 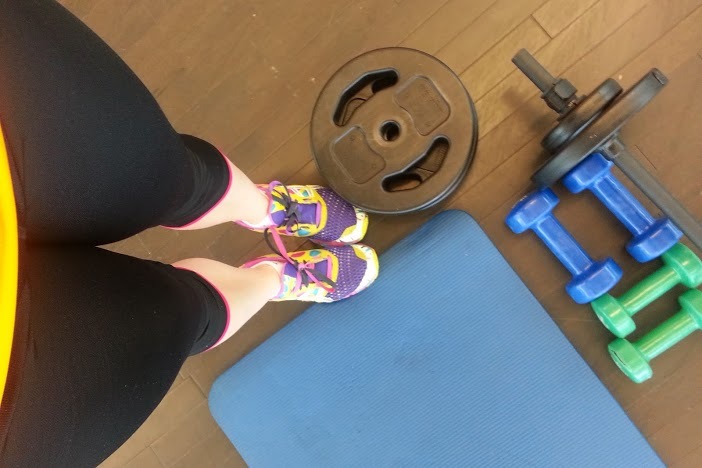 I am very lucky that work has a gym, and allows us to work out on our lunch time. I have found that doing strength and core training makes me a better/stronger runner. I love working out in a group, and am super glad the gym has group strength classes, not just cardio. I get all the cardio I need from running! There is also a quick core class each day called “Lunch Crunch” which is more core than abs. It’s 15 min, so it’s great for when I run and then go do core! Friday night I was up throwing up. Until after 3AM. With no good reason behind it. I’m hoping it was something I ate and not the introduction of a bug to my house. Saturday was a funeral, and then my DH went out of town which left me still sick and responsible for the kiddos. Hard but do able. Sunday was Adeline’s sixth birthday. We had people over, so the AM was spent grocery shopping, cleaning and prepping after taking the kids to breakfast for her birthday. I probably could have squeezed in a quick 2 miler had I felt a little better but I knew I had a lot to do, and had hardly eaten anything in the last 24 hrs, so was worried I wouldn’t make it. Hoping for a better week this week! What did you do for fitness this weekend? Do you have access to a gym/fitness center at work?